If Eliesha and Joel’s adventure vow renewal is any indication, a good marriage keeps getting sweeter — and maybe a little quirkier — with time! The Australian couple, who traveled to North America for an epic road trip from Portland to Manitoba, threw out any form of convention and celebrated their 7th wedding anniversary in the most Portland way possible: with a vow renewal at the famously funky Voodoo Doughnuts, witnessed by the coolest best man ever: Rojo the Llama. 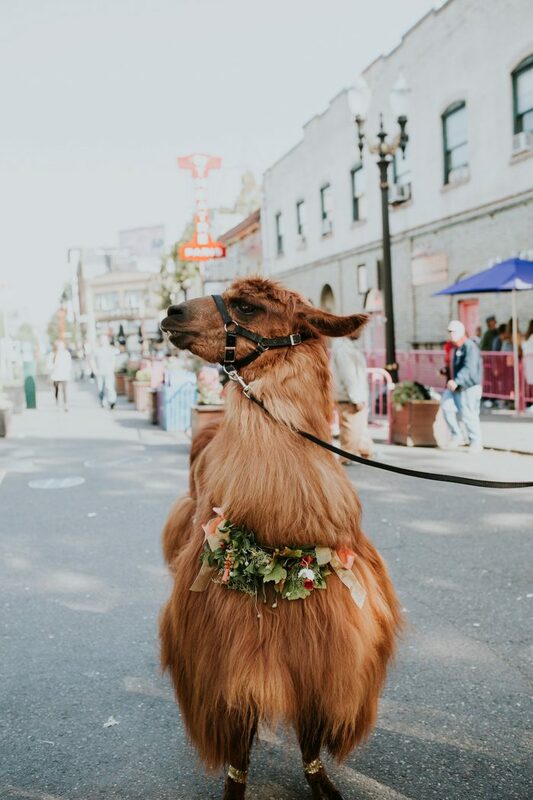 We’re still not sure how they fit 4 humans and a llama into that tiny doughnut shop, but these photos from Jamie Carle Photography are proof they had the time of their lives making it work! Noelle and Will’s Rancho Buena Vista Adobe wedding proves that you don’t need to leave the country to have a destination-inspired wedding! 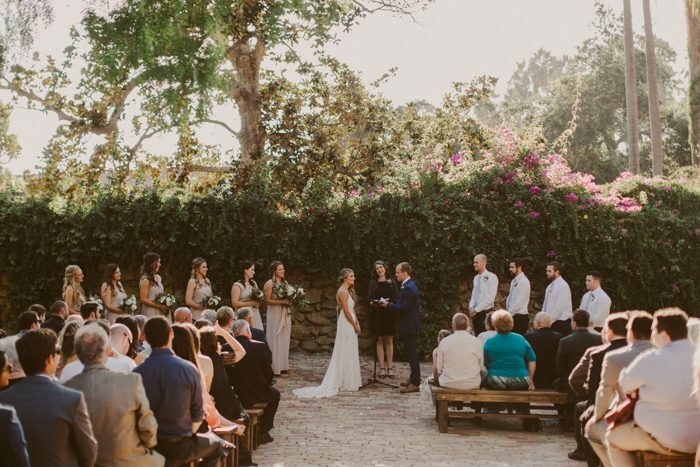 The venue’s Spanish architecture was the perfect backdrop for their laid-back wedding, particularly the outdoor patio that featured a vine-covered rock wall and gorgeous shade trees. Luna Wild Design worked her magic by combining comfy lounge seating with boho pillows and blankets with the Spanish-inspired cutout table runners and muted florals from Native Poppy to create a cool vibe with an old-world feel. Of course, it wouldn’t be a California wedding without tacos, so they provided a Super Tacos alongside ice cream sandwiches from The Baked Bear. Gantes.Co photographers did a phenomenal job capturing the effortless beauty of this lovely Southern California wedding! Corinne and Gordon’s outdoor wedding at Montagu Meadows had all the dreamy free-spirited vibes we love with an unexpected retro twist! 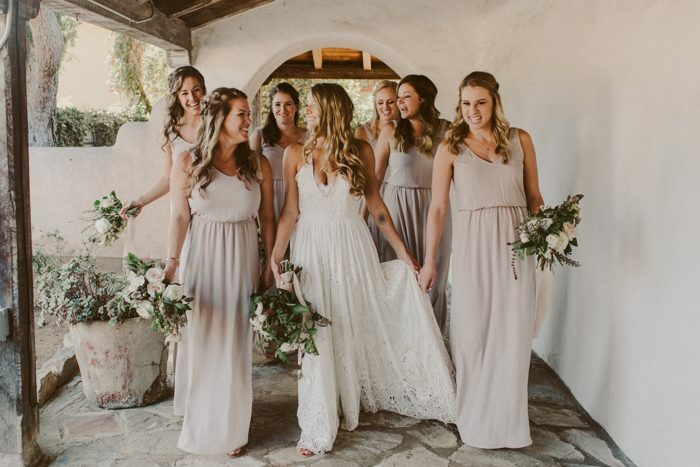 The bride paired her gorgeous bohemian-inspired Rue De Seine gown with layered chokers and long necklaces and finished the look with fabulous floral-print platform booties for a fresh take on classic boho style. With the help of Katie Price Events & Design and Steelcut Flower Co., the couple accentuated the garden venue with rich floral bouquets, handmade dream catchers, hand-painted tambourines, and vintage table decor. 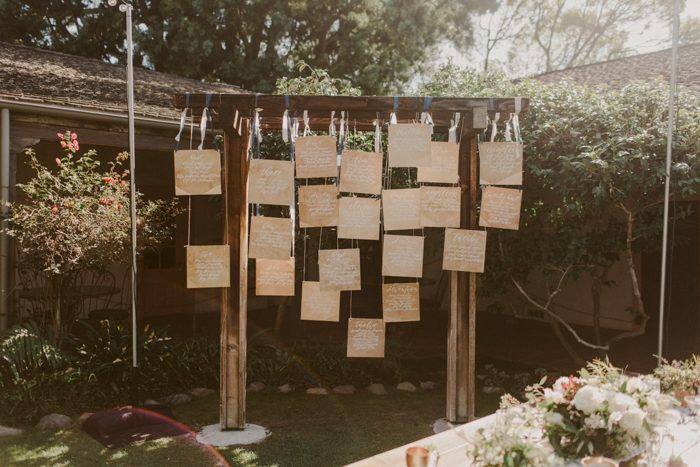 It’s clear in these images captured by Shunkwiler Photography that, although the feel was free-spirited, every detail was thoughtfully and intentionally designed. Corinne and Gordon’s laid-back personalities truly were reflected in every moment of their incredible day!